Italy. The first set is identified by the moulded marks on rear base of each piece, stating "DEPOSE ITALY" with the spider mark of Fontanini. In the pictures you can see it at the white Knight. Only producing 1,500 sets, these pieces are cast in the famous Fontanini cast resin. Sets of this theme with antique gold and silver finishes do exist as well. The second set has exactly the same figures, so I assume it has been designed by Elio Simonetti as well and its origin is Italy and not Spain as said by auctioneer. Italy, by Fontanini in Tuscane, design by Elio Simonetti, "Don Quichot theme"
Italy (Spain? ), design by Elio Simonetti, "Don Quichot theme"
Italy. In 1912 Josef Anton Riffeser founded the ANRI Company, which he named using the first two letters of his first and last name. Josef’s wife, Carolina Riffeser ran the company during the difficult years of war and the absence of her husband. When Anton Adolf Riffeser took over in 1945, he transformed the ANRI company, adopting a more industrial model which allowed for better quality control and distribution to new markets. He was followed by Ernst Riffeser who was able to enlist the services of many well known artists including Juan Ferràndiz, Sarah Kay and others. The ANRI company today is run by Thomas Riffeser, and still remains in the same family. Italië, Valdargena, ANRI Toriart, "Charlemagne"
Italy. That plastic bust chess set looks as if made of wood. Maybe it is a replica of an old chess set, but it can also be a new creation. 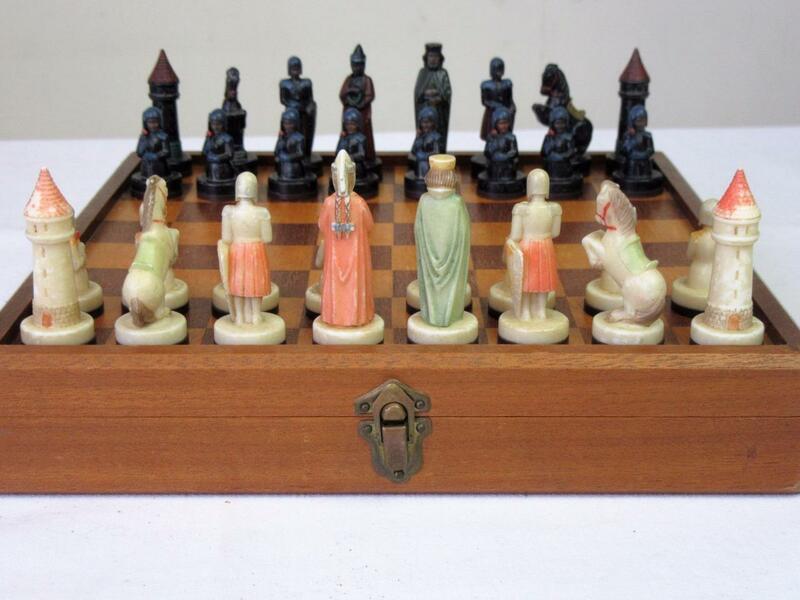 I believe that similar Italian Alabaster chess sets are still sold today.